Found this recipe on Kraft Food. 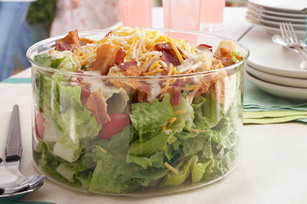 -LAYER all ingredients except dressing in large bowl. -DRIZZLE with dressing just before serving; toss lightly. Size-Wise: Looking for something to serve at your next gathering? This elegant salad makes enough for 8 servings. Substitute: Prepare using KRAFT Balsamic Vinaigrette Dressing.